Mayer was previously predicted to receive just $55 million in severance pay. In December, it was revealed that over one billion Yahoo users had been affected by a hack, just months after a previous hack was announced and reportedly covered up by the company. Yahoo was reportedly aware of the first large hack, which led to over 500 million account details being stolen, in 2014. However, they failed to announce the incident to the public until late 2016. On Monday, Breitbart News reported that the Securities and Exchange Commission is investigating Yahoo in response to the security breaches that took place at the company, and whether they notified investors in a timely manner. 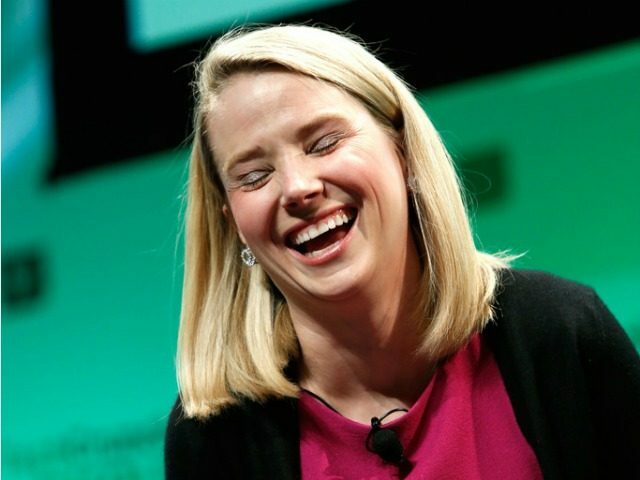 Mayer’s reign as CEO of Yahoo has often been controversial, with the CEO facing a lawsuit last year that claimed she purposely purged male employees, and with several employees of Tumblr, the popular micro-blogging platform owned by Yahoo, also claiming that Mayer and her management were responsible for the decline of the social network. In January 2016, Mayer also faced a backlash after making a joke to employees about the number of layoffs at the company. “No layoffs… this week!” joked Mayer, in response to questions raised by concerned employees. A New York Times report also claimed that Mayer had denied repeated requests for additional investment in Yahoo’s cybersecurity, with the security team allegedly derisively referred to as “paranoids” inside the company. Following both hacking incidents, and the revelation that Yahoo had been secretly scanning user emails for U.S. intelligence agencies, Verizon reportedly sought a significant discount on its purchase of the company, though the exact figure is currently unknown.